Under the aegis of the management of SSSMC & RI, the Departments of Respiratory Medicine and Paediatrics grandly celebrated the World TB Day in the form of a CME “TB UPDATE 2019” – and PostGraduate poster competition on 29th March 2019. Following the prayer song, the gathering was welcomed by Dr. Vishwambar, HOD, Respiratory Medicine. 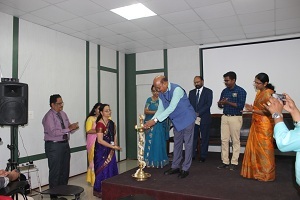 Lighting the lamp of knowledge was done by the dignitaries, our Dean, Medical Superintendent, our chief guest Dr. Senthil Kumar and our guest speakers Dr. Aruna Shanmuganathan and Dr. Umadevi. The programme was inaugurated by District TB Officer (DTO), Dean, MS, and speakers. Dean gave a short talk on the current burden of Tuberculosis in the society and the need for updating medical caregivers on recent guidelines for the treatment of tuberculosis. The talk was followed by MS regarding the role of all the departments in managing TB. The District Tuberculosis Officer, Dr. Senthil Kumar then talked about the theme of World TB Day. The inaugural function came to an end with the vote of thanks being delivered by Dr. PG Rajakumar, HOD, Department of Paediatrics. Dr. Senthil Kumar, (DTCD, DNB) District Tuberculosis Officer and Deputy Director of Medical Services (RNTCP), Kanchipuram delivered the first guest lecture on Diagnostic algorithm on Pulmonary TB-Recent Update. He focused on a separate diagnostic algorithm for Pulmonary as well as Extra-pulmonary TB. Post session, faculties and PGs of various departments interacted with DTO regarding” TB NOTIFICATION” and other issues pertaining to TB diagnosis. The session was chaired by Dr.Lalith Kumar (HOD, General Surgery) and Dr.Gurumani (HOD, ENT). The second speaker Dr.Uma Devi who is a senior pediatrician (Prof and HOD, Department of Pediatrics, Chettinad Medical College and Research Institute) spoke on “Pediatric TB update” and the session was chaired by Dr.Karthika Jayakumar (Associate Dean-Research). She updated elaborately on diagnostic and treatment guidelines for tuberculosis in the pediatric population as well as various challenges faced in managing pediatric Drug-Resistant TB. Post-session she cleared the doubts about the management of TB in the general pediatric population. The third session was an interactive and energetic session by Dr.Aruna Shanmuganathan (Prof, Department of Respiratory Medicine, Chettinad Medical College and Research Institute) who is a member of American Thoracic Society and European Respiratory Society. She expeditiously discussed the complex topic of Programmatic Management of Drug-Resistant Tuberculosis in DRTB in a crystal clear and digestible format. Also, she involved the students by discussing a case vignette for applying the PMDT principles. The session was chaired by Dr.Chinnayan (HOD, General Medicine) and Dr.Shivankumar (HOD, OBG). The session was followed by an active discussion by the delegates regarding airborne infection control, END TB strategy 2025, and cough hygiene which lasted for about 15 minutes. A poster competition for postgraduates and CRRIs on the theme was held between 1.00pm and 2.30pm and 23 posters were submitted, out of which 18 were by PGs.The competition was judged by Dr. Saurabh Shrivastava, Vice Principal, Curriculum, Dr. Abhilash, Vice Principal, Student Affairs, Dr.Nasreen from Medicine Department and Dr.Jaishree V from Paediatrics. The first three prizes were won by Dr. Indhraja Kandula (Paediatrics), Dr. Jackson Bose (Pathology) and Dr. Kalaivani(OBG). A total of 240 delegates (61 PGs, 74 faculties, 75 CRRIs, and 30 students) participated in the programme. The participants of this CME have been accredited with 1 TNMC credit hour. The CME was a grand success providing meaningful insight for the eradication of tuberculosis.